Your well-being is affected every single day by the personal care products you use. Our goal is to create and educate people on truly natural products that have a positive effect on both you and the world you live in for the good of your well-being, for the good of the environment and for The Greater Good. Simply put, we strive to make people's lives better every day — naturally. What are Burts Bees all About? Making people's lives better every day — naturally. Burts Bees Mission & Values Burt's Bees is an "Earth Friendly, Natural Personal Care Company." We create natural, Earth-friendly personal care products formulated to help you maximize your well-being and that of the world around you. To make certain that all their products meet the highest standards, as well as their dedication to ensuring The Greater Good, their products are carefully crafted using ingredients that are the best nature has to offer: beeswax, botanical and essential oils, herbs, flowers and minerals. Burt's Bees, don't waste their time — or yours — pretending to be something they are not. They prefer putting their energy into making the best natural personal care products out there to help you maximize your well-being. They are proud that over half of our 150+ products are 100% natural! Still, they won't be satisfied until all Burt’s Bees products are 100% natural and are currently aggressively pursuing this goal through reformulations and testing. Every product is labelled with a "natural bar", helping you clearly identify the high level of natural ingredients used the range. Additionally, they use only natural colours, some of these include beta-carotene, chlorophyll, titanium dioxide and mica. These natural colours have been proven safe, unlike many artificial colours that have been banned by the FDA over the years. As far as fragrance components go, they use them only when absolutely necessary, and all fragrances are phthalate-free. Since Burt’s Bees products are made from as many natural ingredients as possible, it makes sense that most of their packaging is created from recycled materials, or is developed with recyclability and re-use in mind, like their easy-to-recycle aluminum containers. They don't want to create any additional waste on the planet, and work hard to reduce, reuse and recycle. For example, before launching their world famous lip balm in a plastic tube, it took years to convince a plastic company to make recycled plastic for Burt’s Bees. Now, that very same company is one of the leading manufacturers of recycled plastic. And by the way, the packages are designed to hold just enough product for you to use up before it expires, so you don't end up throwing out half used tubes and jars. Naturally, Burt’s Bees are nothing but the good stuff. There are ingredients that you will never find in any Burt's Bees product. Things like petroleum, which is not a renewable resource and can be toxic. Sodium lauryl sulfate, which is a harsh, aggressive ingredient used in most cleansing products like shampoo. And when was the last time you saw a farmer growing propylene glycol? Rather than loading products up with harsh chemicals or unnecessary fillers, Burt’s Bees offer you only the good stuff. And of course, they will never conduct product or ingredient tests of any kind on animals. A few of the products contain ingredients derived from animals such as beeswax, royal jelly and milk. And for that, they thank them. Burt’s Bees have come a long way from selling home-made beeswax lip balms and hand salves at local craft fairs, but their belief in creating truly natural products that are good for you and the environment hasn't changed. I guess you could say it all started because there weren't many jobs up there north of Bangor. Though we found, grew, or traded for most of what we needed, I figure a person's got to have at least $3,000 a year in actual greenbacks to survive in this old world, especially if you've got kids. I'd been let go from my last three part-time waitressing jobs and had been buying low and selling high at yard sales and flea markets, which brought in about $150 a week during good weather. Burt was enjoying similar commercial success selling quarts of honey off the tailgate of his pick-up truck every weekend between the Fourth of July and hunting season, from a parking lot over in Dexter. He'd been keeping bees around there for a dozen years or more, and had a right nice homestead up on the hill near Garland. Thirty hives, a flock of chickens, Pony and the 8' x 8' turkey coop he'd hauled off from a neighbor's place that he remodeled and lived in were about all he needed. The money he made selling honey mostly paid for his property taxes and gas for the pick-up, and it was just about enough. Well, you can see by Burt's picture there what a good-looker he is, so I figured I'd get to know him better by volunteering to help with the bees. By the end of summer we got around to the heart of the matter, which was the beeswax. He'd been storing it in the honey house for years, figuring sometime he'd use it for something. That time had come, and he suggested I make some candles, which I did, and took them over to the local Junior High School in Dover-Foxcroft, where we sold them at the 8th Annual Christmas Craft Fair and Bake Sale for three dollars a pair. By the end of the day, we'd taken in $200, and we knew that our business venture was bound for glory. Well, as I mentioned, Burt lived in an 8' x 8' cabin and my kids and I were camped in a one room tent, so it was pretty obvious we needed to find more spacious quarters for our growing honey and candle operation. A friend came to the rescue when he agreed to rent out his old one room schoolhouse for $150 a year, which was the cost of the fire insurance on the place. It had been vacant for about fifteen years, except for the mice and squirrels, and though it had no heat, electricity, running water, or windows, the price was right, and it became corporate headquarters. We fixed the broken windows with cardboard, installed a gas kitchen range and some kerosene lamps, and were ready for anything. How we got started making lip balm and ended up in North Carolina is another story, and a long one at that, so I'll save it for some other time. I do hope you enjoy looking through the website at all the stuff we make now. The honey and candles are gone, the kids are grown, our friend sold the schoolhouse and now it's a tattoo parlor, and Burt bought a classic motorcycle with his earnings, but otherwise everything's pretty much the same here at Burt's Bees. Burt's Bees Commitment to the Environment Taking care of the environment is part of the DNA of Burt's Bees — it's inherently part of how we do business. Since the company began in 1989, they built their business on the foundation of Earth friendly natural personal care. They believe that in order to take from nature, they must protect and provide for nature — it's a cycle that they respect and preserve. Their ultimate goal is to be the "greenest personal care company on earth." To this end, they have set wide-ranging goals to achieve by 2020. By that time, they want to be carbon free and operating on 100 percent renewable energy. They want none of their waste to be deposited in landfills. Their office and manufacturing facilities will have LEED certification. And, employees will have ready access to the education, inspiration and motivation they need to make sustainable choices, in their workplace and in their homes. You know by now that Burt’s Bees products are made from the purest natural ingredients available to ensure your and your family’s well-being. But how Burt’s Bees products are created and packaged is equally as important in order to ensure that the environment is protected. Burt’s Bees follow the highest possible sustainable packaging standards. They strive to use the most environmentally responsible packaging systems available that meet or exceed regulatory, product and customer requirements. Burt’s Bees continue to lead by pioneering new systems to further the development of sustainable alternatives for all to use because it ensures The Greater Good™. 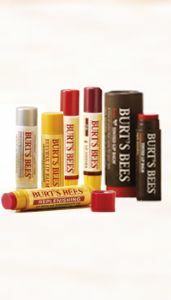 Burt’s Bees new lip balm and lip shimmer packaging labels are now shrink wrap free. In just one year this has eliminated 1800 miles of shrink wrap film that would have been sent to the landfill — enough to wrap the Statue of Liberty 100 times! They have trimmed the excess packaging from many of the products — some by 50 percent! They have pioneered the introduction of TerraSkin™ Wraps, an environmentally friendly, treeless and bleach-free paper alternative we use to package most of their bar soaps. It has a lower absorption rate so can use 20-30 percent less ink when printing. And because it’s stronger and water resistant, it makes for less waste. Naturally Burt’s Bees believe that in order to make the world a nicer place to live, they need to start at home. That's why they support, and are actively involved in, several community initiatives right here in their own hometown of Durham, North Carolina. Their efforts range from social responsibility to sustainability to overall well-being and the list is growing. From saving the environment to ensuring truth in product labeling, Burt’s Bees know that the most progress can be made when we all work together. That's why they have partnered with a select group of like-minded organizations like these. Their work together is making a difference in their community.